The Top 20 Money Losers were 1.434 billion euro in the red in 2011 compared with 1.390 billion euro losses of the Top 20 in the 2010 chart. Eleven of the top 20 loss-makers saw their losses widen in 2011, seven pared losses, while two sank into the red after a profitable 2010. The 20 biggest loss-makers in 2011 came from Romania, Serbia, Bulgaria and Croatia. In 2010, Slovenia was also part of this group. 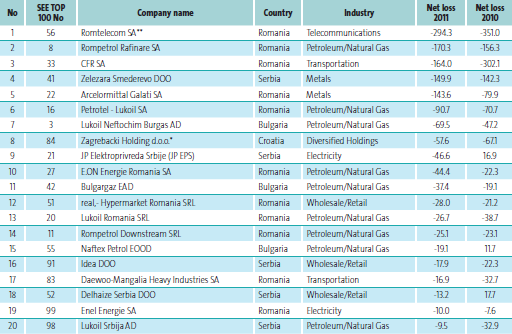 New entrants in 2011 included Serbian power utility JP Elektroprivreda Srbije (JP EPS), Bulgarian fuel retailer Naftex Petrol OOD, retailing group Delhaize Serbia DOO, Romanian electricity company Enel Energie SA and oil specialist Lukoil Srbija AD. Despite its improved macroeconomic indicators, Romania remained the country with the largest number of entries into the SEE Top 20 Money Losers – 11 versus 13 in 2010. After shrinking by 1.3% in 2010, the country’s gross domestic product grew by 2.5% in 2011. Romtelecom, majority owned by Greek OTE, topped the ranking, although the fixed-line telco narrowed its consolidated net loss to 294.3 million euro in 2011 from 351 million euro in 2010 . Last year, Romtelecom was still struggling with declining revenue from voice telephony services. Oil refinery Rompetrol Rafinare SA, which ranked third in 2010, came in second in 2011 with 170.3 million euro in losses, versus 156.3 million euro a year earlier. Its financial woes were prompted by rising crude oil prices, a negative refining margin and increased working capital costs. State-owned railway company CFR SA, the leader in the 2010 ranking, was in the third place in 2011 as its net loss decreased to 164 million euro from 302.1 million euro thanks to improved efficiency of its business. Serbia was the second in the Money Losers chart with five companies. Steel maker Zelezara Smederevo DOO, formerly known as US Steel Serbia DOO, came fourth on the list with a loss of 149.9 million euro, versus 142.3 million euro loss in 2010. Despite the hefty losses, the Serbian government has pledged to keep production at the steel mill going. Bulgaria had three representatives in the loss-makers league in 2011. Lukoil Neftochim Burgas AD oil refinery, controlled by Lukoil, widened its loss to 69.5 million euro from 47.2 million euro in 2010. Gas monopoly Bulgargaz EAD’s loss widened to 37.4 million euro last year from 19.1 million euro in 2010 as the company struggled with a mounting debt resulting from unpaid bills. Naftex Petrol EOOD also sank deeper into the red as its net loss increased to 19.1 million euro last year from 11.7 million euro net profit in 2010.